Sew Serendipity: Making Bags: What in the heck is buckram? Making Bags: What in the heck is buckram? When I started working on bag designs last year, I thought about what makes a bag useful. One of my biggest pet peeves is a bag that simply doesn't stand up for itself! No wimpy bags for this chick! So, of course, that brings me to the topic of today's post which is buckram. "Buckram? ", you say, "What on earth is that?" 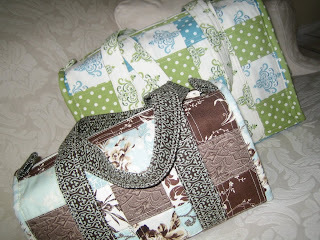 I have gotten that comment a LOT since I designed the Bridget Bag for last spring! To answer the question, buckram is a stiff but lightweight woven stabilizer that is made from cotton fibers. Why do I like it? Because it gives a bag stability in a way that other stabilizers such as Timtex and Peltex do not. Buckram can be creased, which gives you the ability to iron the sides and bottom of a bag, leaving a crisp professional finish. "What is the story behind buckram? ", you ask..... Well, it has actually been around for a long time. It is probably one of the first stabilizers ever developed. It was first used in the process of making drapes. Remember the drapes with pinch pleats at the top? Well, something had to be in there to hold the fabric stiff to get the right look and buckram did the job. Now, it is more common to see buckram on the inside of the front of a baseball cap....take a peek inside and see if you can spot it! Where can it be purchased? That is a good question also. It is not kept in the same area of a store with other types of stabilizers, rather you can find it in the drapery section of stores that sell decorator fabrics. It is sold on a roll, is 20" wide or so, and is fairly economical. Some quilt shops are beginning to carry it also, so keep your eyes peeled! One other thing about buckram. There seems to be about three different weights in the marketplace, ranging from very lightweight (almost like crinoline) to something that is so stiff, I don't know how anyone could sew through it or more importantly, turn the bag right side out after sewing it together....avoid the two extremes and go for the middle weight. It should basically feel like heavy cardstock in your hands. This will provide enough structure for your bag without being too difficult to work with or too wimpy to give the proper support. It is advisable that you should spray your finished bag with something like Scotchgard, as buckram should be dry cleaned only. It loses its umph if put in the washer. I also use a machine needle suitable for denim when making my bags as I usually have several layers to penetrate and hate it when the needle breaks. 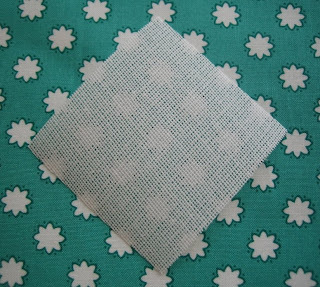 Since buckram is not a fusible product, use a temporary spray adhesive such as Sulky's KK2000 or 505 to layer fabrics. This keeps away puckers and eliminates the need to pin anything, plus these adhesives are safe to use with your sewing machine. 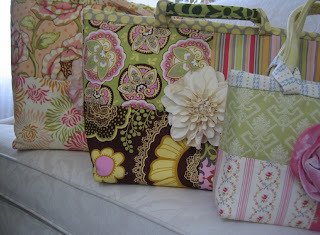 Be sure to check out all of the bags in the Boutique Chic line that use buckram. Once you try it, I think you will see why it is my primary stabilizer!